So, your worst nightmare has come alive? Well, we are just referring to Penguin update. Getting nuked by Penguin penalty is certainly the worst thing that can happen to a marketer. The visibility of the site goes into hiding, the rankings get tanked and the revenue from website takes a nosedive. In short, all your hope of making money from website goes out the windows. The worst part of penguin penalty is that only a tiny fraction of the total number of affected websites gets recovered at the end. The figure is so depressingly low that can demoralize even the most energetic online marketer. What is even more demoralizing is the fact that even after recovering from Penguin penalty, your website will never be able to regain its lost glory. It will take long time to regain the same visibility. Penguin penalty is of two types. One is algorithmic and another one is manual penalty. 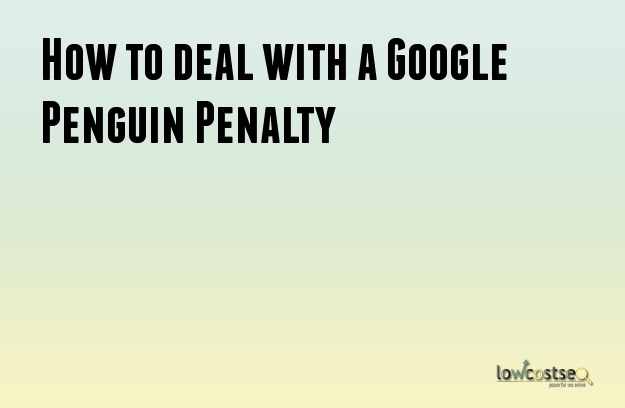 So before you start doing something to recover from Penguin penalty, you need to make sure that you have identified the type of penguin penalty otherwise it will be just beating around the bush. If your website has been penalized manually, you will receive a mail confirming that in Google Webmaster Tools account. But you will receive no such thing in case of algorithmic penalty; in this case, you need to match the traffic loss date with the release date of Penguin refresh. Spammy links trigger penguin penalty and therefore, you have to do everything to get them removed. But before that you need to sort out the spammy links from the list of all inbound links. You have to be cautious because otherwise you will end up removing the good links. Links from irrelevant sites, low quality directories, article directories, bookmarking sites etc should be removed at the earliest. Once you are done with link removal, you need to send a reconsideration request describing what you have done to get rid of spammy links that either you or your SEO partner has built over the years. A half-hearted attempt to remove links is not going to help you at all because the representatives of Google will review the backlink profile of your site manually and if they feel that you have not done enough, they will nor revoke the penalty. So, try to remove as many spammy links as possible. Links that can’t remove or links that you have not actually built should be uploaded to the Disavow Links Tool. By disavowing those links, you are instructing Google to ignore them and not to pass any link juice to your website via them. It is safer to disavow a domain completely rather than specifically disavowing a single URL as it the same page can be accessible via different set of URLs. At the end, you have to wait patiently for the next update of Google Penguin. Once the Penguin algo reevaluates your website, your website will then have a chance to get recovered completely.